Oh… and most of the clip is not in English! BIRTHDAY DANISH IN DENMARK WEDNESDAY. 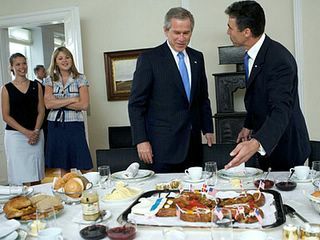 George Bush is presented with his birthday “Danish” in Denmark, of course, on Wednesday, July 6th. His twins, Barbara (on left) and Jenna (on right), who joined him on the trip watch in the background. President Bush stopped in Denmark to show appreciation to the Danes for their support in Iraq and Afghanistan. Denmark has 500 troops stationed in the Basra area of Iraq. Bush, here with wife Laura and daughters, Jenna and Barbara, is visiting to express appreciation for the several hundred troops the Scandinavian nation has contributed to the U.S.-led fighting in Iraq and Afghanistan. 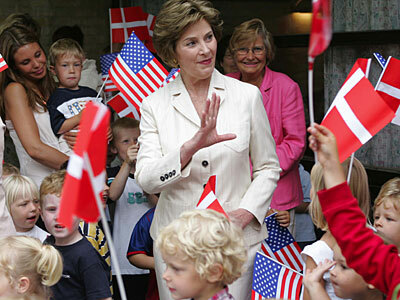 Laura Bush and the Bush Twins joined the President on his 59th Birthday in Denmark. The press has been reporting on the protests against Bush during his Denmark visit. One protest when he arrived included 200-250 black clad youth who protested against Bush by burning a US flag. A rally on Wednesday was expected to have up and over 20 thousand proteesters but fell several thousand short of that. The Pro-US Rally was not reported by the AP. 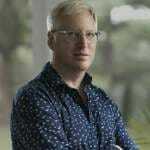 But… Chrenkoff is on it!